My God! It looks like Christo ripped her off. Is Hera going to sue him for copyright infringement? How do I contact Hera? 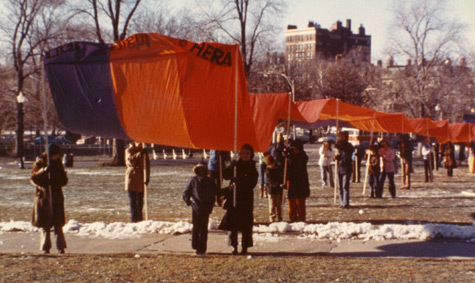 I asked Christo and Jeanne Claude in the Q & A at their Knickerbocker Club talk Thursday, February 17th if they were "inspired by my Canopies for First Night 78 on the Boston Common They claimed that they were "too old and couldn't remember what happened in 1978". Amazing isn't it, how well they remember 1979! We have to be wide, humble and appreciative as artists. We have to notice and acknowledge all of the blooming around us and how it has nourished our blooming. I believe Hera showed Christo this picture of "Canopies for First Night." Wouldn't that jog his memory or hers? If not it's up to them to give her the benefit of the doubt. Don't you think? At least a nod, right? Will Christo the man just go down in history as another huge ego in the arts? Can artist who's work is so huge and impactful escape the infinite smallness of an egocentric world view? I believe they can, but not if they don't make an effort to stay humble, not in our hype driven world. If they don't make this effort they are just like any political leader who wants their mark to be the deepest mark, who's actual priority is themself and their reputation/legacy. Jazz musicians acknowledge each other and their ancestors all the time. So do people in many other arts and religions. Christo, at this moment, is on top of the art world. I'm wondering if he would be able to take a close look and consider acknowledging Hera. The sad probability is that being grateful and appreciative is probably not one of his priorities these days. Hey folks I say shout out. Imagine an art world where folks were diligent about acknowledging each other whenever they could and thinking carefully about the sources of their art. This Gates thing is so big, we could start the habit of appreciation right here Christo to Hera and just keep it going. It will lift us all up. Can't see the beauty of it?